Outback Splash at The Maze, based in the Swan Valley, has been around since 2013 when its visionary owners added the Water Park to the existing attraction. Since then, they have made it bigger and better every year. Most recently they have added Octopus Bay, an area specifically designed for the youngest visitors. On any warm Perth day, you will find the area filled with parents relaxing back in the shallow waters and younger children exploring the slides and water features. One of the bonuses of Outback Splash is that there is something for every age group and this latest addition makes this venue a place for the whole family from babies right up to adults. This area operates from September school holidays through to April and includes a 35m splash pool, 3 giant octopus slides and miniature tipping bucket, as well as plenty of features to explore. Located close to cabanas and a lush grass area, as well as the well-appointed change rooms, Octopus Bay is ideal for younger families with children under 10 years old. If you haven't cooled off at Outback Splash yet, it's definitely time to explore this great attraction. There is so much to explore and for your one-off entry fee, you definitely get value for money. The Mazes - after all it is at "The Maze" but there is not just one. As you head away from the Water Park, you find yourself in a tranquil, green setting that houses 5 different mazes to explore. 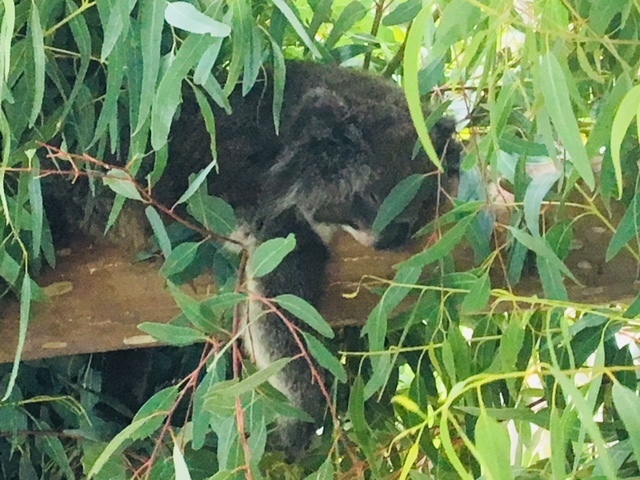 The Animals - as well as a wombat arriving soon, you will find koalas, kangaroos, emus and lots of different birds scattered through the grounds. This makes the venue perfect for tourists and overseas visitors. Find out about the animals here. Picnic areas - there are plenty of places to enjoy a picnic here, whether you want to sprawl on the lawn, grab a picnic table or hire a marquee or cabana. Playground and giant jumping pillow -completely wear out your kids with the playground and jumping pillow located on the "dry" side of The Maze. Cafe Iguana -don't feel like dragging your esky around? Not a problem, there is an onsite cafe with scrummy food to satisfy even the pickiest of eaters. Mini Golf - as you exit the park, you will find the mini golf course ,which is included in your one-off entry price. 1) Hire a locker - for only $10 a day it's a great investment for keeping your valuables safe while you are enjoying the water park. 2) Remember your thongs - just like the beach, the ground does get hot so bring your flip flops so you aren't doing that "hot sand" dance to the water. 4) Bring your own - you are welcome to bring your own food and shade sails if you like. It is suggested you buy your tickets first, then come through the entry with bulky items. 5) Slip, slop, slap and sip - don't forget it's hot and you will probably be over exerting yourself with all the water slide fun, so remember to bring sun protection and keep hydrated. Outback Splash at The Maze and its new area, Octopus Bay, are a cool day out for both Perth families and visitors to the Swan Valley. Keep an eye out for new, upcoming additions to this attraction on their website here.